“EVERYONE KNOWS IT’S WINDY.” SUBJUCTION; TIME LOVES A HERO! It’s funny how coincidence works out. 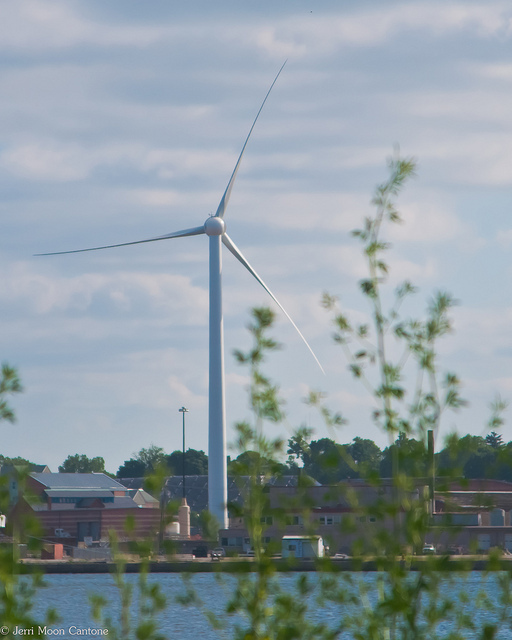 Recently 3 new wind turbines have been installed down near the Port of Providence, at the top of Narragansett Bay. How do I know? How can anyone not know! They literally tower above the landscape, and yet some people are not even aware they’re up and running. Personally, I love to see it, and imagine what potential wind power means to the world. I’m not here to debate the politics, or engineering of wind power. In fact, when I am not writing critically acclaimed blogs (what else would I say; random, and wildly unpopular graffiti? ), I earn a living as a technician in a conventional, natural gas-fired power plant. I have been told on more than one occasion that I should not be such a proponent of wind power as its proliferation will put me out of a job; I’m not concerned. I also won’t even go in to the conversations with “others” about the idea of supplying clean, cheap, and abundant power to the entire world with Cold Fusion. I know it’s a big dream, and far off, but let’s just say there are more than a few in the “industry” that will never be confused with the “energy Illuminati.” Anyway, last week as I sat at a red light, I suddenly noticed that the rotating blades from the turbines several miles away could be seen as they pop up from behind the trees, over the traffic signal and disappear behind the houses in the neighborhood. To me, it was as pretty as a shooting star. It was at this point I recalled 2 different pictures with different themes that I had seen only hours earlier. The first one was in the auto club newspaper travel section. It was an ad for Holland. It had a big picture of a windmill. The second picture was the contest winner from a bike ride to Montauk, NY. There were bicycles, people, and smiles all over the grounds of the “best rest stop;” a large windmill. Suddenly I wanted to know, at what point did windmills go from iconic to scourge of the landscape? How often is this the case? Buildings, memorials, structures, and advertisements that start out being hated, wind up becoming” time-honored proverbial members of the family.” Let’s check it out. The Citgo sign over Fenway Park in Boston, or the White Stag sign in Portland, Oregon. In today’s world, government, or civic permission would never be given to such vernacular architecture, but now that it’s there, any talk of tearing them down, or moving them, is viewed as treason. The Eiffel Tower in Paris was supposed to be a “temporary structure.” There were plenty of initial screams from the artists who claimed the builders didn’t understand the difference between engineering, and architecture. It is now the most visited paid monument in the world. The Vietnam War Memorial is one of the most visited and moving sites in the United States. James Watt, Secretary of the Interior under President Ronald Reagan, initially refused to issue a building permit for the memorial due to the public outcry about the design. Vincent van Gogh; now; one of the most admired, and respected painters of all time. Then? Grossly under appreciated, and further unheard of than “edible dirt”, died at age 37. We could go on and on; the purchase of the state of Alaska, Boston Celtic great Bill Russell, Nikola Tesla, and the Slinky. The World Trade Center Towers in New York were mostly empty at the start forcing the Port Authority to move in just to fill some space; the love for them came long before the love from their tragic end. Maybe it’s the nature of the human race to subconsciously scale back excitement for new things so they have a chance to mature until they are ready to stand on their own, and not get over run by the bright lights of the “instant classic;” The World Wide Web, Game 6 of the 1975 baseball World Series, Water Fire in downtown Providence, or the Empire State building. Standing “the test of time? I can only hope. Recently, a friend sent me one of those “inspirational / self-help ” email messages. It said “do something today that your future self will thank you for.” Maybe my present self wasn’t up for the task, concerned that the future would not be so kind………Naaaahh! I wrote back, and told her that my “present self” just hid 2 chocolate bars in the freezer that my “future self” should discover in a few days. Love the chocolate in the freezer for future self. Have To Agree……Wind Power Is A Darn Good Idea!!!! !